Globalisation, off shoring and outsourcing are a reality for most organisations in order to reduce costs and maintain competitiveness in their given markets. The DDM solution suite has been extended to include multi-site database replication. Organisations who are expanding globally suffer from poor network performance due to shared network traffic and crossing national boundaries. 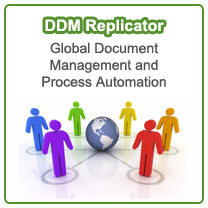 DDM Replicator provides companies working across multiple sites fast searching and access to the latest information. Each remote site connected through a Wide Area Network, has access to up to date information from a local synchronized database. The key factor here is to provide users optimal local performance combined with global availability whilst ensuring data integrity. This server side replication solution works seamlessly alongside DDM RIFS (Remote Intelligent File Servers) and the DDM workflow process automation tools.